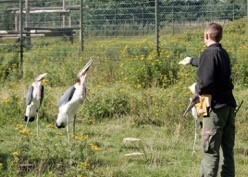 (with a specialty in bird training) at zoological facilities through their company, Avian Experiences. Most people that work in the animal field can look back on their lives and point to a moment when they first discovered animal training through the use of positive reinforcement. It may have been as a child when they went to a zoo or saw an animal show. Maybe it was as a young adult, early in their careers or maybe it was much later after they had been working as an animal professional for a number of years. Chances are that once we discover the mysteries and excitement associated with this wonderful communication tool, we begin a quest to learn as much about it as we can, and begin to use this technique to communicate more effectively with the animals we care for at work, at home and even in our relationships with people. However, there are also people that have the opposite reaction - they mistrust the methods and the goals of training animals using positive reinforcement, believing that the animals are at risk of losing their wildness, or that they will become overly focused on treats, thereby compromising future training, safety or even the animal’s dignity. We can make the argument that this is simply due to a misunderstanding of the processes at work. In both the case of the passionate animal trainer and in the case of the skeptic, there is a need to understand how animals learn and what motivates them to behave as they do. When we truly understand the underlying process, we can use that knowledge to improve the welfare of our animals and mentor others to do the same. Our animals are not mind readers, they are not born with an innate knowledge of what we want or need from them. They need to be taught. They need to learn. 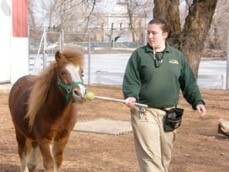 Animal training is a method of teaching. Anyone who modifies an animal’s behaviour is training them, whether it is done intentionally or not. When we walk into an animal’s environment to feed them, clean them, or move them, we are modifying their behaviour. Every human/animal interaction begins a behaviour pattern, or contributes to an already existing pattern, that will then help us to predict the animal’s future behaviour. We can see that the animal is learning from routines, or learning responses to our behaviours and cues, or even responding to environmental cues. These learned behaviours are the result of Operant Conditioning. Operant Conditioning is a type of learning in which an animal learns from consequences. Animals are learning from the consequences of their behaviour both in the wild and in captivity. Animal trainers and caretakers provide specific consequences to modify the animal’s behaviour and achieve a specific behaviour goal. There are two types of consequences - the ones that stop behaviour (otherwise known as punishers) and the ones that increase or encourage behaviour (known as reinforcers). There are two methods of training animals using these consequences: the system of treats and rewards (things the animal wants to obtain) and the system of aversives (things the animal wants to avoid). In the wild, animals learn behaviours by encountering punishers, reinforcers, rewards and aversives. It is the same when humans interact with them to modify their behaviour and train them. At this point, I hope that even the skeptic can agree that if we are interacting with the animal, we are training it, and it is learning. I also hope we can agree that the animal is learning through consequences, whether we are intentionally or unintentionally controlling those consequences. So lets examine some scenarios and the consequences that are commonly provided for animal behaviour in captivity. A keeper places an animal’s breakfast in an adjoining space and the animal gets up from rest and moves into the new space. The animal is fed (the consequence) after moving (the behaviour). A keeper scratches the back of an animal who solicited it and the animal suddenly snaps its jaws at a cage mate who has gotten too close (the behaviour) and the keeper withdraws her hand (the consequence). A keeper picks up a hose near the animal and the animal gets up from rest and moves into a new space. The animal is able to resume resting (the consequence) after moving (the behaviour). A keeper scratches the back of an animal who solicited it and the animal suddenly snaps its jaws at a cage mate who has gotten too close (the behaviour) and the keeper pokes the neck of the animal (the consequence). As you may have noticed, the first two examples use systems based on treats and rewards (things the animal wants to obtain), while the second two examples use systems of aversives (things the animal wants to avoid). The first and third examples use reinforcers (to encourage a behaviour), while the second and fourth examples use punishers (to stop a behaviour). When an animal keeper/animal trainer wishes to encourage a specific behaviour, they must first decide what system they will use. As you can see from the above examples (numbers one and three), behaviours can be encouraged using either system. Of course there are side effects to both systems, and understanding the side effects can help trainers make the best decision. The side effects of using a system of treats and rewards include greater participation by the animal in training sessions, the animal offering additional behaviours as well as the animal offering bigger and stronger behaviours. The side effects of using a system of aversives include the animal avoiding the trainer, avoiding the training area, a reduction in behaviours offered and/or aggression. Often, trainers choose a system of aversives because it provides a quick fix, and we as humans seem to have an intuitive sense of how to apply aversives to modify behaviour and accomplish our goals. However, the side effects of this choice may be so undesirable that we instead choose to use a system of rewards. Rewards based systems take a lot of practice and knowledge to master, but in the end they can really improve an animal’s relationships and welfare (not to mention our own). Ok, so you have decided to use a system of treats and rewards to achieve your goal behavior. Are you ready to start training? Not exactly - the next thing trainers need to do is to identify the things that impact the animal’s motivation to participate in the training session and work for that reward. Rewards can be everything from a more comfortable space, tactile reinforcement or food rewards. For the purpose of clear communication and repetition, food rewards usually work best. Animals in the wild have to work for their food (the word “work” in this case means: to use problem solving and expend energy). Some animals forage for many hours, gathering small bits of food that make up the calories they need to replace the small bits of energy they use to find it. Other animals expend lots of energy to hunt and catch prey that in return provides large amounts of calories for the animal’s consumption. In both cases, once the animal has consumed all the calories it needs, it becomes satiated (has no hunger at all) and will not hunt or forage. But as the animal digests the food, it gains motivation to hunt or forage with each passing hour until it finally is hungry enough to work to acquire its meal. It is a natural and healthy process for animals to feel hunger and to have the opportunity to use problem solving and expend energy to acquire food and to achieve satiation. Trainers can use this natural process in order to gain the animal’s motivation to participate in training sessions. An animal that lacks the opportunity to work for their food by problem solving is missing out on a huge part of what would normally comprise their natural life. As human caretakers, I would argue that it is our duty to provide these opportunities wherever possible to increase the animals’ quality of life. Working for their food also can provide exercise opportunities, thereby challenging an animal’s body as well as their brain. The delivery of the animal’s diet should then reflect the ways the species would eat in the wild. 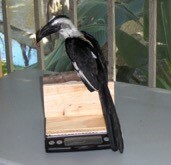 For example, a forager like a parrot could be trained for its food rewards two-three times over the course of the day. Whereas a hunter like a lion may only be trained once a day, or less if it is given the opportunity to become completely satiated. Does an animal need to be completely satiated every day? We can look to the habits of animals in the wild to determine what is appropriate in captivity. In the wild, some days provide more opportunities to eat than others. Since animals in the wild do not get the same amount of food every day, we can deduct that they do not become completely satiated every day. But ethically, we should provide enough opportunities for our animals to achieve some degree of satiation every day. In other words, the animal’s motivation to participate in training or work for their food should be high at the beginning of the session or the day, and it should decline to the point where the animal is no longer willing to behave with the same intensity or progression towards the goal at the end. For example, consider a parrot that is learning to have its nails trimmed voluntarily. At the beginning of the training session, the bird allows the trainer to scrape its nail with a file one time before it pulls the foot away (the trainer delivers the seed after scraping the nail once, just before the bird pulls his foot away). As the session progresses, the trainer works up to four scrapes before the bird pulls his foot (the seed is delivered quickly after the fourth scrape). Then later in the session, the bird starts pulling its foot away after three times, then two times, then the bird won’t present his foot for filing at all. The trainer tries different techniques to get better results, but the bird will not present his foot for filing for more than a second. We can deduct that the bird is satiated. He will still eat the seed if it is offered for free, but he will not expend the mental or physical energy needed to earn the seed at the criteria he was willing to accept earlier in the session. In another scenario, perhaps you have a pride of lions that are asked to shift from the outside yard to the inside den area once a day. But today, they receive a large carcass in their outdoor area. Later that day, and again the next day when the lions are asked to move inside for some meat, they choose to remain in the yard instead. They are satiated and not willing to move inside for the food. However, they are not completely satiated because they will eat the meat that is subsequently tossed over the fence to them. This is what I mean by achieving some degree of satiation. The animal may not be fully satiated to the point where they refuse food that is delivered to them for free, but they will no longer work for it at the level to which they have previously demonstrated complete willingness. When we see this occurring, we can feel comfortable that our animals have received an adequate ration of food, and they will be willing to problem solve and expend energy to earn that food again in the near future so training can continue. Of course there are times when there is another explanation for the decline in motivation, but it is our job to learn to tease these out and deal with them as they present themselves. Some of these factors are listed later. When we talk about food rewards, there are different ways of managing the animal’s food ration in order to create value in the food reward. In some situations, there are rare or no leftovers of a diet ration the next day (as in the case of the meat delivered to some carnivores). The diet is carefully measured on a daily basis to prevent obesity. In this case, the animal could be trained for its entire diet since every last bite has value for the animal. In other situations, the animal will have 10-30% leftovers every day, but there is a high value item that the animal would gorge on if given the chance. This item is usually carefully measured because it would impact the nutrition of the diet or the pocketbook of the institution if the animal was allowed to feast on this item to the point of having leftovers (as in the case of tree nuts or peanuts for parrots). In this case, the animal could be trained for this high value item, and then given the rest of its diet (allowing for leftovers) after training is complete. In other cases, the animal may participate in training sessions for this high value item even if the diet is present during training. In each of these three scenarios, the animals weight and body condition either remains the same or improves with the process of managing the animal’s diet for the purpose of training. Once the food reward is determined, the trainer should also determine what time of day the animal will have the right degree of interest in the food. Many animals repose in the middle of the day, choosing to hunt or forage in the morning and evening. This also tends to be when most animals are fed. It would be most effective to conduct training sessions during those times. Keepers tend to have the most time to train animals in the middle of the day, but that can be a hinderance to making good progress if the animal lacks motivation at that time. Other factors that affect the animal’s interest in participating include social dynamics with conspecifics as well as with humans, weather and other environmental factors as well as a host of other things. Good trainers learn to identify each of these items and find ways to reduce or work around them or use them to the advantage of the training. Seeing the connections between the lives of animals in the wild and the lives of the animals we care for can help us eliminate misconceptions about training as well as improve animal welfare. Animals that have the option of problem solving and exercising to obtain food rewards will lead a life that more closely mirrors life in the wild versus an animal that receives it for free. Animals that are trained using a system of treats and rewards will increase their behavioural diversity, which also more closely mirrors life in the wild, without the side effects of aggression and apathy. Managing food rations to control obesity and maximise nutrition can work as a valuable training tool and allows caretakers to reflect the food consumption of the species in the wild. Don’t we owe it to our animals to explore the world of training through a system of treats and rewards?